Okay! 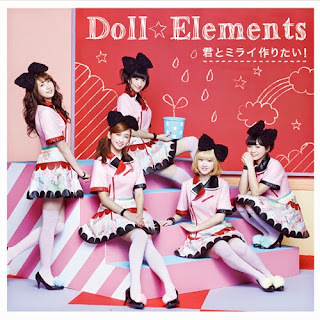 Musume Time: Let's Feel Happy and Energetic with Doll☆Elements' 'Kimi to Mirai Tsukuritai!' Single! Let's Feel Happy and Energetic with Doll☆Elements' 'Kimi to Mirai Tsukuritai!' Single! and yet I will always procrastinate, because that's what Chiima does best! HAI!!! With their next single already planned and a PV up an' running on the youtubez already, I thought that it was about darned-time I got this review written and posted, because, y'know, I wanna review the groups newest PV at some point, too... just not until this single review has been posted, that is. So, procrastination be damned, we're gonna review this single, because guess who really likes it? For a while now, my love of Doll☆Elements has slowly been growing, a bit like a plant I suppose, and ever since I purchased this single, I can only see that love towards them growing more and more as time goes on. The group is cute, they have catchy tunes, and the single I am about to review seems to offer something different each time, and yet caters towards my personal tastes each time. There are many elements about this single that are just appealing, and I find it downright entertaining, too. So, yeah, already we know it's a winner, but what's the content like? Well, I'm gonna tell you, and I'll tell y'all now. Without further ado, we're going to get into this review, and I will stop my babbling for this really weak intro. As I allow Doll☆Elements to grow on me like a tree, will you also allow them to plant a seed into your hearts, and allow it to blossom into love and devotion? 1. Kimi to Mirai Tsukuritai! Okay, so, we already know that I like this song - it's the entire reason I bought the single in the first place. As a tune, it's perfect for spring; light but energetic, fun and sweet, and also hopeful as well as extremely memorable and great to listen to. It isn't a Graduation song, which I'm thankful for, because the happy vibe that Kimi to Mirai Tsukuritai has is extremely infectious and absolutely adorable to listen to. Really, it's just a fantastic song, and I am really happy that this was chosen as the A-side. Yes, this song does have familiar sounds within its instrumental that make me think 'yes, this is a D☆E song', however it's still a great track that doesn't sound too much like its predecessors, nor does it borrow a great deal that could make it sound like some really bad carbon copy of another singles A-side. I just love this song, really; it's my favourite from Doll☆Elements so far, thanks to its sweet sound and that happy melody, plus it gets bonus points for not being a Graduation track, and instead being a song that is (hopefully) about growth and friendship... at least, that's what the video tells me. It's not a disheartening tune, nor is it something to cry over. It's just cute, a tad sentimental, and overall very caring in its sound. It's a great spring song, and my favourite of the season so far. By far, this has to be my favourite A-side from the group right now, and I know that I won't tire of this gorgeous piece any time soon. The second I heard F a k e, I couldn't help but be reminded of my secondary school days, back when I listened to club remixes - because that's what this song is, though a watered down version I admit, of club remixes from the 90's and early 2000's. So of course I absolutely LOVE IT! F a k e is a fun song, one I may have initially disliked a little if it wasn't for the fact that it took me on a gigantic nostalgia trip. I mean, I love Club Music, but some of it gets irritating after a while, however this song doesn't - it has enough going on sound-wise to keep me interested. I admit, Runa's voice gets a tad grating on the ears and really doesn't fit this sound like the other girls do, however the rest of it is fun and enjoyable to listen to. Upbeat, catchy, playful in its sound... it's a nice song. I also love the addition of the clapping sounds that you can easily smack your hands to when listening to the beat. It pretty much reminds me of a club though, and I love picturing a Music Video to this song; if anything, it is a song that you could easily visualise, especially if you imagine a club-like scene. It's great, and I do enjoy hearing it. I mean, I could never see this as an A-side track for Doll☆Elements, their image is way too pure and plastic for that (because they're dolls and all), however as a B-side it's a new, fun way to see these girls, and to show a new direction in style that they can do that I actually never imagined they would play around with. Basically, F a k e is fun to listen to and a great track to the single. It allows me to hear a new side to the Doll☆Elements sound, whilst also tripping me back to the past with this nostalgic Club Remiz sound. What do I think of when I hear this song? 90's~early 2000's Romance Movie Songs, and more specifically, Perfect Day from the opening of Legally Blonde. I don't know what it is, but this song just screams 'cheesy Romance Movie song', and I rather like that about it. In fact, I downright adore it, because it's all shades of cute and cheesy, and reminds me of pink, sparkly things and Elle Woods trying to grab her man in law school. Y'know, cheesy movie garbage, right? Essentially, it's just one giant dollop of Idol cuteness that will make you grin and sing along stupidly, if you like that sort of thing. It won't be for everyone, don't get me wrong, but the song is so hepped-up on sugar and Idol crack, I think it could make most people smile (or at least, I hope it would). It's just happy and bubbly, a cheerful song that is so adorable and in-your-face in the sugariest of ways. I feel hyper just listening to it, to be honest. Plus, it makes me want to watch Legally Blonde. The Musical. Maybe the second movie, too! MAYBE ALL THE MOVIES? Not the third, that ones horrible. In short, though, this is a really nice song, and I do like it a lot - it hails from the 90's, I swear! (Dreamusic are going the Avex route, it seems~) As a song, it's downright adorable when you hear it, it's all things sugary, it's sweet, and it hurts my teeth a little, but it's also all things Idol, and it makes me smile like a goof! What's not to love about LOVE ME DO, eh? Okay, so whilst this song actually doesn't make me want to scream and shout like the title suggests, I do think that this is a pretty damn fun track, and feel a bit sad that it wasn't present on my Regular edition single that I bought; regardless, though, I'm still able to listen to it, and I really enjoy it. I enjoy it as much as the other songs, actually, and think it's pretty darn great - once again, it's filled with Idol crack. Thing is, Scream and Shout sounds like Avex's E-girls Idol crack, and that surprised me a little when I first heard this song. Now, though, I just want D☆E and E-girls to collaborate. Because Idol crack, and they'd sound so good together. Seriously, though, this sounds like Anniversary!! or some other generic E-girls song to me. The styles are pretty similar, and it has a dance beat that is infectious and so darned catchy, but also memorable and extremely fun to listen to. It's a great track, honestly it is, and I could see myself dancing to it. Heck, I can picture D☆E dancing to it, E-girls, too - it's such a dance-heavy sounding track, and seems like it would be fun to rock out to during a concert. But, yeah, I can't shake the similarities of this song and what E-girls do out of my head. But damn, Doll☆Elements do this type of song so well! So, despite such a deceiving title, it really is a great song to listen to - it'll be something that will be entertaining to hear during a concert, and to basically just see when performed. It's energetic, cheerful, happy-go-lucky, and very dance-heavy in its sound. Hopefully, it's just as dance heavy as the song sounds, otherwise I'd be disappointed as heck! Okay, so I feel I was a bit sloppy in this review, but that despite how bad my writing is here, I managed to get my feelings across~ For that I apologise, but for now, let's just move ahead to the Conclusion. HAI~! So yes, as you can probably tell already, I do really like this single, as much as I like Yuuka Ueno's Hoshitachi no Moment / Slow Motion, actually, though I can't really compare the two, either - this single is filled with upbeat, catchy Idol songs, whilst Yuuka Ueno's single is sentimental, soft and powerful, hitting you in the soul when you hear them. For Kimi to Mirai Tsukuritai!, we have four songs that are all different, but all create a fun and vibrant setting regardless of their tone, and I love that about Kimi to Mirai Tsukuritai. Both singles are equally amazing, but both set a totally different vibe for Spring, I believe. I enjoy all four of these songs, and what I love about them all is that, despite their different tones, each song is positive, filled with happy emotions, and energetic in sound and voice. None of these songs are sad or lonely, but simply hopeful and energetic, sweet or, even when cool, still fun and enjoyable for the listeners. This single is very much an Idol single, I believe, because it brings me hope and happiness when I listen to it. With each track, I feel like smiling and singing along, and that's an amazing thing - I want to join in with Doll☆Elements, and I love that the single makes me feel this way; it's exciting, invigorating and so wonderful to hear all of these songs. They're powerful in their own ways, but I love that all together, they create a pretty fun single and show that happy side to spring other Idols don't. It's not all about Doom and Gloom in the spring, ya know!? 4/5! Yes, I like it ju~st that much! Seriously though, I do enjoy listening to this single. It's fun, easy to get into, and has some really catchy and memorable songs, all with their own distinct styles, but all happy and energetic as well. So, if you love Doll☆Elements, or you just love the cuteness of Idol songs, then definitely look out for Doll☆Elements' Kimi to Mirai Tsukuritai! It's worth every listen, every repeat, and every shuffle, I promise! For now, that is all in Review land! Hopefully next time I will have a PV Review for you all, but for now I hope that I have introduced some of you to the joys of Doll☆Elements and their amazing spring soundtrack, Kimi to Mirai Tsukuritai! If you're already a repeat listener, then I hope that you all check out these songs, too, and enjoy them just as much as you do the groups title tracks! Until next time though, I will have to bid you all adieu, and wish you a happy day and week ahead~ Love Idols, and stay strong, Wota brother and sister'ing!